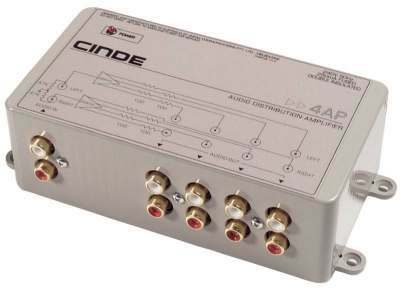 A general purpose 1-into-4 stereo audio distribution amplifier for installation use. The compact ABS case has mounting flanges and block diagram on the cover. Designed with economy in mind, this is possibly the lowest cost ADA on the market, but employs the same high integrity circuitry as our mainline products to ensure superb signal reproduction. Unity gain (terminated). Designed for unbalanced line level signals such as VCR, CD, multimedia etc.